Any plant that is growing where it is not required or desired can be called a “weed”. Weeds are problematic to grain cultivation for various reasons – they compete for moisture and nutrients, they may cause problems during harvesting, they may contaminate or discolour grain, their seeds may be poisonous and they may harbour pests and diseases that affect the intended crop. Weeds are usually characterised by rapid and profuse seed production, they spread easily and grow rapidly. They usually have very well developed root systems, and they are adapted to most conditions. They are difficult to control, hardy and compete very aggressively with the crop for moisture and soil nutrients. Weeds usually mature very young and therefore reproduce quickly. Weeds have various ways of reproducing and these have to be taken into account when control of weeds is planned. Weeds can set seed (usually quickly and prolifically), some have underground stems (rhizomes), some have creeping surface roots (stolons), some have tubers and others have bulbs. The seeds of weeds often remain viable for a very long period – they are able to wait in the ground until conditions become favourable for them to germinate. Weed seeds also do not all germinate simultaneously – some germinate and others will only germinate at a later stage. This germination is often triggered by the cultivation of the soil. 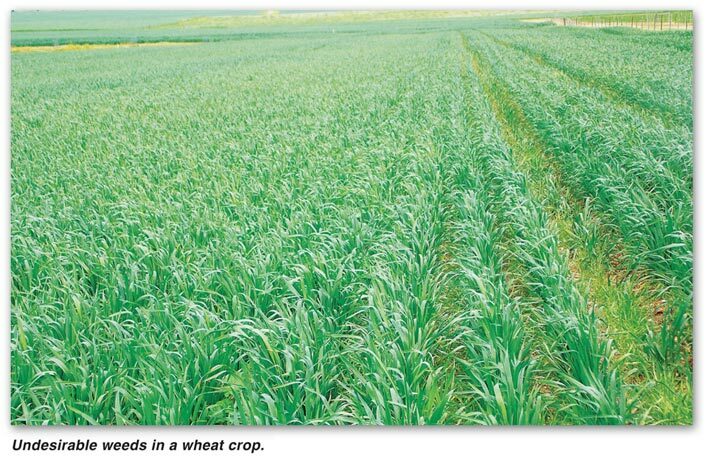 The broad leafed weeds are comparatively easy to control chemically, whereas the wild oats and other grass like weeds which have a similar growth cycle as wheat, can be a real threat to wheat farming. Weeds may complete their life cycle in less than one year – or in a season (these are called annual weeds), or they may live for more than a year but less than two years (these are called biennial weeds), or they may live for a long time and reproduce every year (these are called perennial weeds). Why is it important to control weeds in crops? Weeds compete with the crop for soil moisture, nutrients, space and light. This competition impairs crop growth and retards development, thereby reducing the crop yield. This competition may cause contamination of the crop seed, a decreased yield or decrease in the quality of the seed crop. 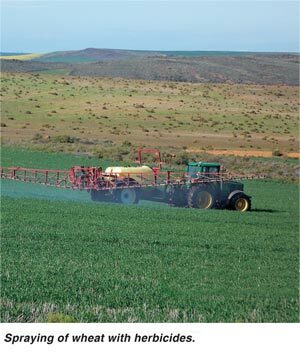 The competition offered by weeds varies from crop to crop and from weed to weed – it may cause little as 10% or as much as 98% reduction in crop yield. The drift or vapour of the spraying action may affect crops that are adjacent to the crop being sprayed. The strength and direction of the wind should be considered before spraying on any particular day. Soil-incorporated herbicides cannot be used where conservation tillage is practiced because thorough incorporation of the herbicide would bury too much of the stubble, and the application of the herbicide would have to be adjusted to compensate for that which falls on the stubble. In addition, where there is stubble on the land, the weed emergence tends to be delayed and erratic and the efficacy of pre-emergence herbicides may be reduced. Before any decision can be taken regarding methods of weed control, the relevant weeds should be identified and the farmer should know when these weeds will pose a problem. Article adapted from the Wheat Production manual which is sponsored by the Winter Cereal Trust.